The major difference between the Combat Utility Knife and the Soldier is the U.S. stamp on the rubberized grip and a color scheme that better matches the colors of the military. Although the sales from military personnel don’t make up a huge portion of the company’s sales, Victorinox is hoping that awareness of the brand will increase as a result. Sales of the iconic knife have slumped since it was banned from planes following the attacks on 9/11. 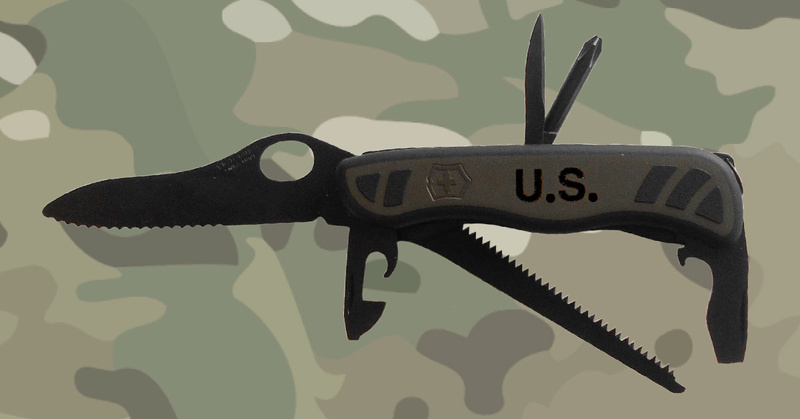 The knife received a national stock number (NSN – 1095-01-653-1166) last year, but I believe soldiers are just finally able to start ordering it. Here is one of the only video overviews of the knife from Tactical Rifleman posted last month. Those of you who aren’t in the military can still pick up the Victorinox Soldier or the German Army Knife. Please put me in touch with Joe the knife guy. First, Victorinox is a world class cutlery company and makes world class knives and tools. I’ve got eight of their 111mm knives, including the current German Army Knife (GAK) the Bundeswehr began issuing in 2003 to replace their former knife dating back to 1968 and the 2008 Soldier issued to Swiss enlisted soldiers to replace their 1961 Soldier (2008 is when the Swiss Gov’t selected it for issue with their specs). Both are direct derivatives of the Vic Trekker and were made in 2016. I’ve also got the two civilian equivalents of the 1997 DAK (Dutch Army Knife) and the 2010 DAK, both of which are 111mm Victornox. My remarks are not about Victorinox who has nothing to do with this. This is such a farce! The US Government hasn’t bought a single one of these nor has there been nor are there any plans for any contract to buy even one of them. Anyone can get a CAGE Code. The process takes about 45 days and it’s free unless you pay someone to do it for you. Anyone with a CAGE Code can get a NSN assigned by DLA to something by contacting one of the several US Gov’t agencies with oversight on issuing NSNs (part of the NSN characterizes what commodity and type of item it is). Just because someone with a company name and business license has a CAGE Code and some Snake Oil they’re hawking has a NSN does **not** mean the US Government has let any contract to buy any of it, not now, not in the past, nor does it mean they plan to at any time in the future. Setting up a LLC, getting a CAGE Code and then getting a NSN assigned to something can be done by one person from their living room, den, garage, or even your back porch. It’s done all the time by those with get rich quick dreams of winning the government procurement lottery selling a bazillion of something to Uncle Sam’s DoD. Once they have the NSN they go around like a door-to-door salesman, especially around the beltway, hawking their wares with four-color glossy trifolds and videos to anyone who will so much as glance in their direction. Such is the case here. These knives are being hawked to the US Government in hopes of landing the Big One in which every Soldier, Sailor, Airman, Marine and Coast Guardsman gets handed one by the US Government, like free candy at Halloween, all to be sold to Uncle Sam by Windrose Group, LLC in Williamsport, PA. The knife is a Victorinox Trekker that’s been blacked out and had its scales replaced (very easy to do in under a minute) with one’s they’ve had stamped with US which can be done very easily. Companies specialize in marking Swiss Army Knives with corporate and event logos to be used as swag. It’s a pass-through with very little value added by Windrose Group, LLC. Who are, or more correctly **is** Windrose Group, LLC? Information about the company is here (and it’s the same as on other sites that specialize in information about companies). I’ll summarize it. Windrose’s president is Jerard J Rinder, who lives at the company’s business address. It’s a residential home; Google Maps’s Street View is marvelous. The LLC was created in 2016, about two years ago. It has an annual revenue estimated at about $56k per year with approximately one employee. Calling it a “group” is laughable. The company email address is a “gmail” account in his name. This is one guy operating out of his home. Found him on LinkedIn and according to his public listing there, he works for Woolrich in Williamsport. Don’t quit your Day Job yet, Jerry! The front man hawking these in the video can’t even pronounce the company name correctly, calling them Victronix as if they’re an electronics maker. Then he lies through his teeth about the US Army procuring them. Nobody in the entire US Government has bought any of these under any contract and that includes DLA, GSA and the entire DoD, the latter of which encompasses all of the US Armed Forces. He goes on with his lies about how soldiers can magically fill out requisitions for knives that have NSNs as if they’re buying stuff from Amazon Prime. The DoD logistics and supply system simply does NOT work that way. It’s not uncommon for a company trying to sell something like knives to dump a couple crates of them onto a military unit or two in hopes of crating a grassroots clamoring demand for them. Watch companies will send some “tacticool” watches to a Seal unit or two and then claim the US Navy Seals are using them. Good ‘ol Jerry did the same with a pile of them at the AUSA convention (private organization and private convention, not a US gov’t sponsored event). Had them available for those present. Of course, these US Army officers and senior NCOs will go back to their units and large numbers of soldiers seeing them will want one of their own, asking how to get one. It’s like spreading seed hoping it will magically grow a crop. Not the first guy to try this and won’t be the last. If he made only $2 per service member profit on it, with a total US Armed Forces strength of about 2.2 – 2.3 Million uniformed personnel would be pushing about $4.6 megabucks of US taxpayer money, and that’s the net profit after all costs are paid. The US Army hasn’t bought a single one of these, nor has any of the Armed Forces, nor has DoD, nor has DLA, nor has GSA for anyone else in the US Gov’t in addition to DoD. This isn’t about Victorinox the Swiss Army Knife company. It’s about Toto pulling back the curtain on Windrose. JOE KNIFE GUY HERE. WE HAVE SOLD SEVERAL THOUSAND OF THESE ALREADY TO DLA AND DIRECT TO MILITARY AND L.E. AGENCYS. Great info on the product.